Today I get the pleasure of interviewing the author of the book, The Heroine Next Door, Zeena Nackerdien. In the format of my previous interview, my comments are in Green and Ms. Nackerdien will be Blue. Tell us a little about The Heroine Next Door. Leila is a flawed middle-aged woman caught in the cross-currents of different cultures in the developing and developed worlds. Life is a young Muslim woman living in the wine region of South Africa leaves her largely isolated from political strife, because she concentrates so hard on being a perfect, obedient child. However, there are glimpses of frustration as she notices her fiancé, Khalid, being favored over her in class, even though she is a bright girl. As she grows up and encounters the experiences her beloved father spoke about first-hand, she has to wrestle with controlling emotions and pursuing her goal of attaining an education to help herself and her countrymen. She is an ordinary person in extraordinary circumstances. What brought you to decide to write this story? The cliché, “one person can make a difference,” usually refers to a star or a focused individual who achieves a goal through successful application of an action plan. Most people I know do not operate that way. We make mistakes. Our lives are not the stuff of Hollywood drama. I was tickled by the idea of taking an ordinary, flawed human being with a very complicated past and making her the conduit for solving “boring” problems. The series of vignettes focus on countries and problems and difficulties in communication among human beings, rather than being a linear narrative with a villain and a hero with whom one can escape into paradise. I see that you are a biochemist and previously published in journals regarding your work in the scientific community. Did that experience help prepare you for writing fiction? N-o-o. In fact, the level of technical detail necessary in scientific papers is exactly the polar opposite of what is needed to be good at writing fiction. However, scientists and engineers are solution-driven and always being challenged to think outside the box, especially when most normal people would simply throw their hands up in the air and walk away. Before the hate mail starts flowing in about confining my remarks to those two groups, I am only saying that because they form my frame of reference. Shout-out to all the brick-layers and plumbers etc. that toil away to ensure that we have a functioning country. Being born and raised in another country, how has your adjustment to American culture been? Any bumps in the road or interesting missed communications to share? It was the best of times, it was the worst of times…Oops, your question has nothing to do with Charles Dickens. I have known the joy of peer acknowledgment for my work and I have known the misery of job loss. No, I am not interested in sharing missed communications. I love the fact that I now understand myself and celebrate my loved ones. How often do you visit South Africa? How has your time in the United States changed or altered your perception of life in your home country? Every few years. My perceptions have evolved with age. Youthful exuberance at being able to move around in a country free of apartheid laws has been tempered with an appreciation of the beauty and complexity in both countries. To this day, the USA–a “rainbow nation” forged from the blood, sweat, and toil of immigrants–remains a model of successfully governing people from a dizzying array of cultures and fostering innovation. South Africa lags behind the USA by a few centuries in terms of making the transition from a new government freed from its colonial past to lifting the majority of its citizens out of poverty through effective infrastructures. Technology has accelerated progress along this path. In a country with 11 official languages, it is amazing that communities in “siloes” are now collaborating on business ventures and that a young painter from Khayelitsha can now attend a leading university in Cape Town. At the same time I am frustrated that change is not happening at a faster rate. I think that I am experiencing the same types of emotions as people who remember the civil rights era in this country. What message would you like to share with young women in your home country? Be true to yourself, whether you have conservative or liberal values. Women over the millennia have been typecast in different categories, as illustrated in the poem below. The truth is that every woman can be a mixture of all these archetypes depending on her personality, experiences and reactions to events. It is important to be brave, but also forgiving, because no one is perfect. Beautiful sentiment. Thank you for your time Ms. Zackerdien and I wish you continued success with your writing endeavors. 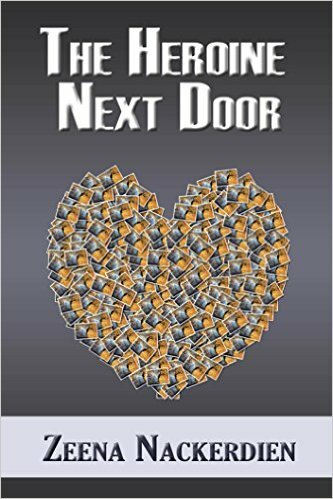 Ms. Zackerdien’s book, The Heroine Next Door, can be found on Amazon.com at the link below. This entry was posted in Interview and tagged author, interview, the heroine next door, virtual author book tours, zeena nackerdien. Bookmark the permalink.